In order to filter by the "in queue" property, you need to add the Entityqueue: Queue relationship. Susan Pamerleau wasn’t breaking new ground, but she is digging deeper. When she took over as Bexar County, Texas’ sheriff almost four years ago, her already-full agenda became busier when she learned the extent of the jail population with mental illness. Those inmates counted for 22 percent, their conditions were going untreated and typically contributed to longer stays. “Frankly when I became the sheriff… I really didn’t recognize the issue about mental illness,” she told attendees at the National Stepping Up Summit April 17–19 in Washington, D.C. “There were 450 people (with mental illness) who had been in and out of our jail six times. That is indeed the kind of thing that county leaders have been pushing over the past year, an effort that culminated in the three-day summit, sponsored by NACo, the American Psychiatric Association Foundation and the Council of State Governments Justice Center. Teams from 50 counties, out of more than 200 applicants, heard from experts in mental health services, criminal justice and administration on the local, state and federal levels, plus participants in the mental health system and their families. Stepping Up is part of an overall effort to encourage counties to divert jail inmates with mental illness to settings where inmates’ underlying conditions can be addressed. That direction has stuck with Pamerleau and she has spread the word. She offered Sen. John Cornyn (R-Texas) a chance to meet the largest mental health provider in the country — the Los Angeles County Jail. “We’re not professionals in mental health issues,” she said. “We’re not professionals, necessarily, in law enforcement. “For us, we want to make sure that we’re asking the right questions,” in framing the problem correctly and providing support for change where necessary. “It’s hard to convince others it’s the right thing to do,” she said. L.A. County District Attorney Jackie Lacey knows that. Lacey’s approach was to sell jail diversion to community groups first to generate public support for the new direction, which was funded by the Board of Supervisors in 2015 to the tune of $120 million to create the Office of Diversion and Reentry. University of Connecticut professor Robert Trestman stressed communication, consistency, confidentiality and quality assurance in the diversion process. Confidentiality is also crucial to acceptance and participation. Pete Earley shared his bipolar son’s experience with the intake process and how it worked out positively. Earley praised the Fairfax County, Va. police officer who had crisis intervention training and, when he picked up Earley’s son walking naked down the street, exercised his discretion, did not handcuff him and drove him to the hospital while keeping him calm. Earley chronicled the process in his 2007 book Crazy. Ray Lay, both a mental health counselor and a patient with dual mental and substance abuse disorders, cautioned attendees to be patient expecting people with mental illness to adjust to medication. Cornyn cautioned against forcing a top-down approach to reforming judicial processes. For that matter, though many urban counties participated, the Stepping Up Summit also made room for rural counties to discuss how they approach the problem of reducing the occurrence of mental illness in jails despite lower population density. Pennsylvania Secretary of Corrections John Wetzel, who worked as a correctional officer in Franklin and Berks counties, said counties had to have clear plans for where offenders would go each step of the way, and make it clear who will benefit. “If what you’re doing, I can’t draw a line to how it’s going to benefit me, I’m not inclined to invest,” he said. Council of State Governments (CSG) Justice Center Director Michael Thompson sketched the future of the Stepping Up initiative, which may include providing technical assistance to counties that demonstrate potential for reducing the number of people with mental illness in their jails and designing and implementing state and local collaborations in selected jurisdictions. CSG is considering holding an annual national summit of county teams and a diverse group of stakeholders to advance comprehensive plans for system change and highlight promising practices and help counties track their progress. During the summit, the American Psychiatric Association presented the inaugural American Psychiatric Excellence (APEX) Awards to House Minority Leader Nancy Pelosi (D-Calif.), Sen. Al Franken (D-Minn.), Florida Sen. Miguel Díaz de la Portilla (R-Miami-Dade County), journalist Cokie Roberts and the television show Orange Is the New Black. Charlie Ban is the County News digital editor and senior writer. Socks featuring the counties of Washington state help county officials dress to put their best foot forward. Around the United States this April, county governments are making themselves and their functions known to the public in celebration of National County Government Month. Here's a sampling of how counties are celebrating, you can see even more here. Economic Development Administration on chopping block? As President Trump targets the Economic Development Administration (EDA) for elimination in his 2020 budget proposal, counties are touting the Commerce Department agency as a boost to local economies. For years, people who didn’t go to college or didn’t finish college often hit stumbling blocks when applying for certain jobs. In Boulder County, Colo., depending on their work skills and experience, they might be welcomed with open arms. Surveys: A couple thousand dollars for your thoughts? County officials can’t read residents’ minds, but some try the next best thing to see what their constituents are thinking. Hillsborough County, Fla. launched an online resident survey April 8, hoping to gather more than 1,000 online responses to add to complement a phone survey of 1,300 people. Marion County, Iowa Sheriff Jason Sandholdt talks about funding mental health care, in a video from ISAC. In the fight for long-term funding for mental health services, Iowa counties are recruiting supporters from the general public. Mary Neubauer does it pretty well. 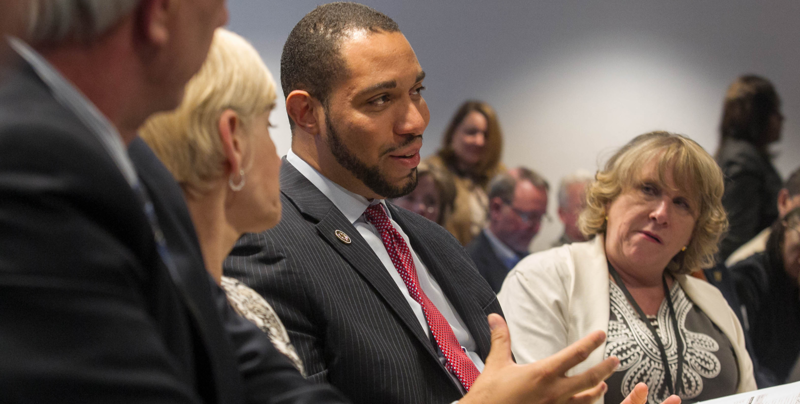 Arts advocates got a bonus from counties during this year’s National Arts Action Summit and Arts Advocacy Day as both the NACo Legislative Conference and the Americans for the Arts-led event landed in the same time period. Throughout their lives, during their service and after, Sonoma County Calif.’s veterans demonstrated their resilience. It’s what kept them alive in the field, and for those who wound up homeless, kept them alive on the streets. Stay up-to-date on topics affecting America's counties. Hoping to stop a growing measles outbreak, Rockland County, N.Y. has declared a state of emergency, barring unvaccinated minors from public places. The New York City metro area county of 300,000 west of the Hudson River has confirmed 153 cases of measles since October, with 48 in 2019. This week's video includes an update on the proposed Waters of the U.S. rule, efforts to repeal the 40% excise tax on high cost employer health plans set to take effect in 2022, testimony in support of the Economic Development Administration and more. More than 20 million adults in the United States have a substance use disorder. NACo, supported by the John D. and Catherine T.
LUCC is the leading forum for urban county leaders and is the voice for America’s metropolitan counties before Congress and the Administration. Nearly 2,000 county officials and partners participated in the 2019 NACo Legislative Conference in Washington, D.C., focusing on federal policies that impact counties and our residents.